These versatile SUVs are perfect for getting out and exploring what New Zealand has to offer. Very popular with skiers, there is plenty of room for both the skiers and the ski gear. If you are going to Queenstown this really is the essential vehicle during winter. 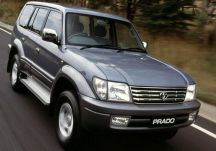 1996-2002 Toyota Prado Landcruiser comes with: All terrain tyres, seats 4 but only sleeps 2: has one full size double bed. Cooking equipment: Pots, pans, cutlery crockery. Bedding & linen: Duvet, pillows and sheets. Optional hire of extra tables and chairs NZ$25. Optional extra Roof top tent (NZ$500 per Hire).